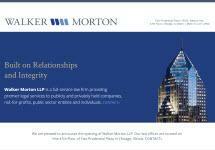 Walker Morton LLP is a premier full-service law firm serving the United States and beyond. We are a boutique law firm with a multifaceted approach to protecting the interests of businesses, stakeholders, entrepreneurs and individuals. Our lawyers have earned reputations throughout the country for our focused representation, personal service and integrity. Many legal issues do not fit neatly within a single box, but overlap into other practice areas. Our business model helps our clients ensure that interests are not overlooked in resolving one legal issue. For instance, business succession planning and personal estate planning matters may overlap. Our full-service business representation is unsurpassed throughout the country. We are headquartered in Chicago, Illinois, and provide a national and global reach. Our mobile lawyers often travel throughout the country to provide direct service to our valued clients. To learn more about how our industry-leading lawyers can help you to protect your business, real estate and personal interests, as well as your legacy, call 312-471-2900.